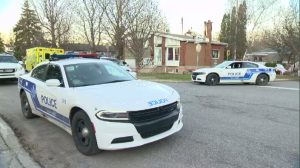 Three people are dead and 11 are in the hospital after an overnight fire in a Longueuil apartment complex. The flames broke out at around 1:15 a.m. Saturday morning in the building on Toulouse St.
Strong winds made it difficult for the firefighters to extinguish the blaze. 14 people were transported to the hospital, where three of them died. There is no fear for the lives of the 11 others wounded, according to the Ghislain Vallières of the Longueuil Urban Police Service (SPAL). A tenant is still missing, but everything indicates that the individual was not at home during the fire. "I looked outside my window and saw the fire," said neighbour Julie Beaulieu. "I saw a firefighter come out of the building with a young girl and others leaving the building, waiting on the block." Temperatures dropped below minus 20 degrees Celsius overnight with the windchill. "Unfortunately the fire spread quicker because of the cold," said Michel Hugureot, who was one of 80 firefighters who fought the blaze. Three buses were dispatched to the scene to keep tenants in the building warm. Red Cross teams were on hand to provide comfort and help the victims. A large security perimeter has been established around the building. The perimeter encompasses Toulouse, Perigny, and Terrasse Turcotte streets. SPAL investigators were on site early Saturday morning to collect information from evacuees and first responders. Firefighters estimate that the blaze caused a million dollars worth of damage, and that the building is a total loss. They said that it's too early to say if the building's fire alarm system was functioning properly at the time of the blaze. If you'd like to lend a hand, contact the City of Longueuil to find out how: 450-463-7311, ext 311. 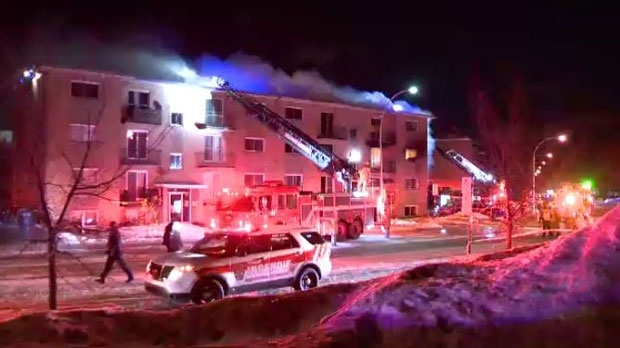 Three people have died after a Saturday morning apartment fire in Longueuil. 11 others are wounded with non life-threatening injuries.